I have such oddly shaped feet, it’s quite difficult to buy shoes that are comfortable. Shoe‐shopping is always a time‐consuming ordeal. 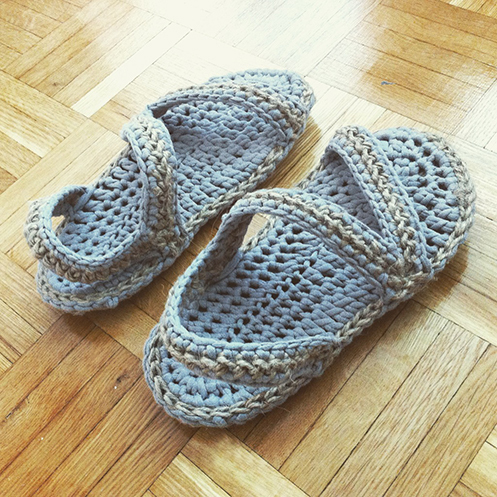 So I thought, maybe I’d crochet my own shoes! That way I could make them custom fit and comfortable! I have no idea how to make shoes, but I thought for sure there’d be patterns on Etsy, so I looked, and came across a pattern by Wildflower and Sage. I love that it includes instruction for making the shoes outdoors ready. There actually aren’t very many like this one out there. Jute is actually kind of hard to crochet with, and I had to use a larger hook than called for. No wonder the pattern called for hemp. Oh well. I just took lots of breaks in between so my wrists don’t get too sore. So finally I finished making the two soles. If I make them again I probably will follow the pattern for regular width rather than instruction for wide, since I had to use a larger hook. I think wide was too wide. But it’s still ok! 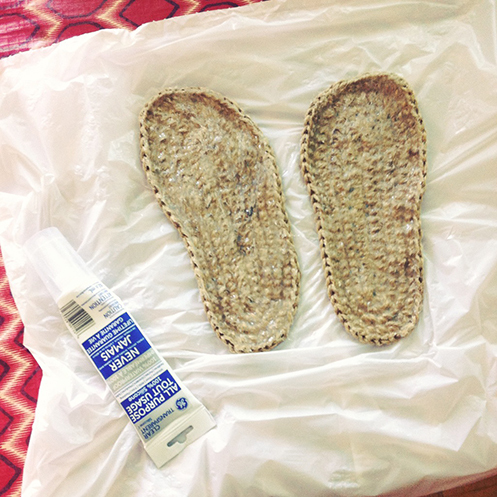 There I am waterproofing the soles by lathering them in silicon caulk. The fume was stronger than I thought. Ventilation is imperative. Slowly working on the straps, trying them on as I go so the strap placements feel right :D I made the insoles with Bernat Maker Home Decor, which feels kind of like a t‐shirt yarn. They’re actually really quite comfortable! 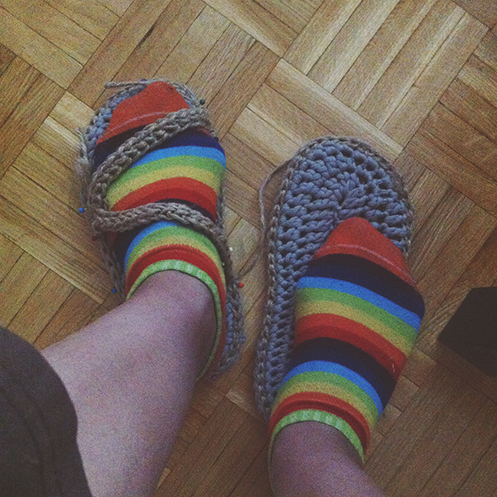 I think I made the straps on the right shoe too tight though, they keep pushing my foot forward out of the sandals. But maybe as I keep wearing them and the straps stretch the problem will correct itself. I’m quite happy with them! Will find an opportunity to test them out outside sometimes! Hope everyone have a happy rest of the week! I’m so glad they worked out for you! I have found hemp to be much easier to work with than the jute but harder to find. It is used in jewelery making so I’ve found it at the hobby store in the jewelery section. I’ve also found it on amazon. 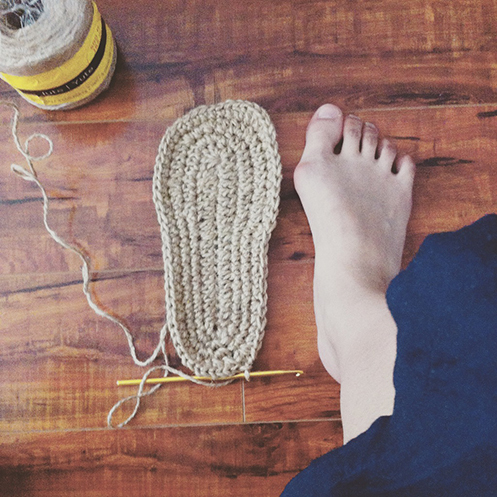 Thanks so much for trying out my pattern and featuring it on your blog! WOW! you constantly amaze me with your creativity. Although I really like what you have done, I will stick to my KEENS which have good support for high‐arched feet. 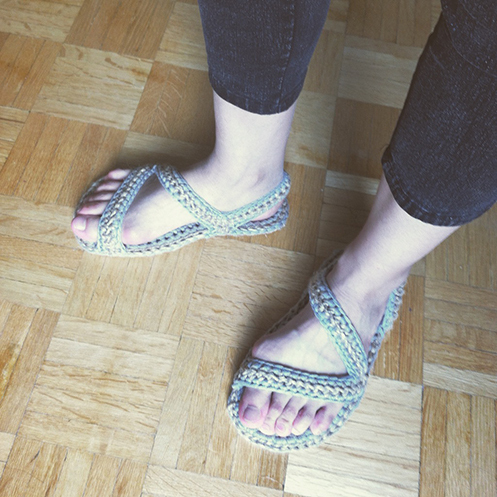 Ces sandales sont originales et très jolies. En plus, elles semblent bien confortables. Je vous souhaite de pouvoir les porter tout l’été. Ici en France, sauf dans le sud du pays, il pleut presque tous les jours depuis plusieurs mois alors il vaut mieux se chausser avec.…des bottes en caoutchouc!! Thanks Claudine! 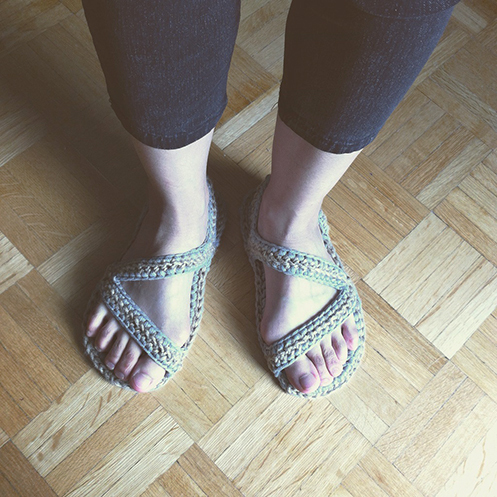 i look forward to wearing them out :D hope you get to enjoy some sunny days!